If you start almost any new ASP.NET project in the new preview of Visual Studio 2013, you’ll find a reference to the Owin package inside. OWIN (the Open Web Interface for .NET) is a specification designed to decouple web servers from the frameworks and applications they host. The OWIN goal is to provide a lightweight, modular, and portable platform for mixing and matching components, frameworks, and servers. 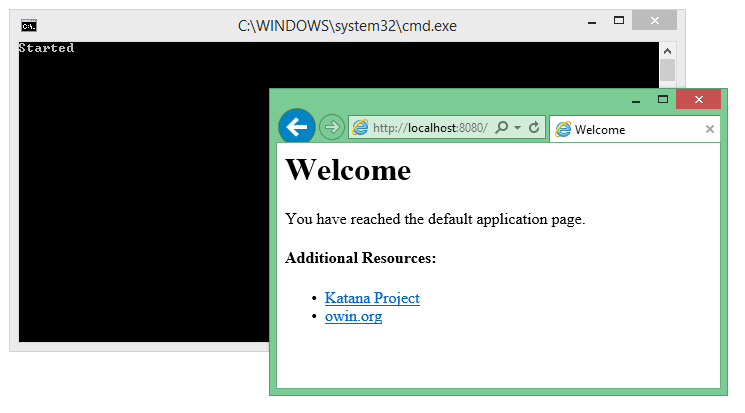 Katana is Microsoft’s implementation of OWIN components. The code is available on CodePlex. In a future post we can talk about how OWIN compares to System.Web, but first let’s get a simple example up and running from scratch. Inside the Main entry point for the console application, we can use the WebApp class to start an HTTP listener. The Startup class used as the generic type parameter to WebApp.Start is a class we’ll have to implement, too. Other extension methods allow for more fine grained control over the request and response processing. For example, UseHandlerAsync from Owin.Extensions allows for a more traditional “Hello, World” response to every request. So far this doesn’t appear much different than self-hosting WebAPI in a console application, but in some future posts we’ll dig a little deeper into some examples showing the loftier goals of OWIN and Katana. I'm looking forward to your next posts in this series. From what I've seen and read, it looks like owin/katana is the future for .net development to run on. Although someone at TechEd told me IIS only takes up 1%. So hosting out of IIS doesn't seem to be worth all this effort. Running on non-Windows OS or Microcontrollers (next gen Micro Framework?) then? @David: Yes, micro frameworks. Plus. Katana can be the place for cross cutting concerns like authz and logging. Interesting... Looking forward to the next posts on this topic.